Mitanni was a Hurrian kingdom in northern Mesopotamia from c. 1500 BC, at the height of its power, during the 14th century BC, encompassing what is today southeastern Turkey, northern Syria and northern Iraq (roughly corresponding to Kurdistan), centred on the capital Washukanni whose precise location has not yet been determined by archaeologists. The Mitanni kingdom is thought to have been a feudal state led by a warrior nobility of Indo-Aryan descent, who invaded the Levant region at some point during the 17th century BC, their influence apparent in a linguistic superstratum in Mitanni records. 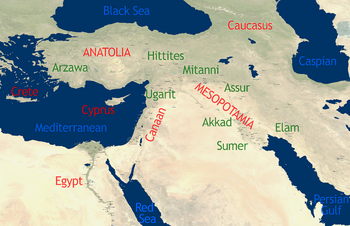 The spread to Syria of a distinct pottery type associated with the Kura-Araxes culture has been connected with this movement, although its date is somewhat too early.Yamhad was an ancient Amorite kingdom. A substantial Hurrian population also settled in the kingdom, and the Hurrian culture influenced the area. The kingdom was powerful during the Middle Bronze Age, c. 1800-1600 BC. Its biggest rival was Qatna further south. Yamhad was finally destroyed by the Hittites in the 16th century BC.